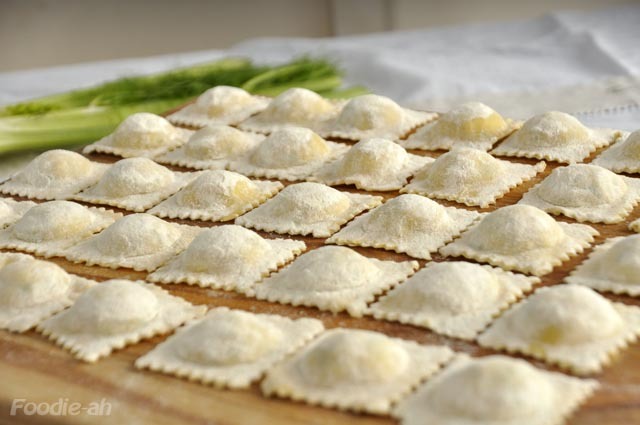 I love ravioli in all their variations, larger, smaller, in different colors and textures. 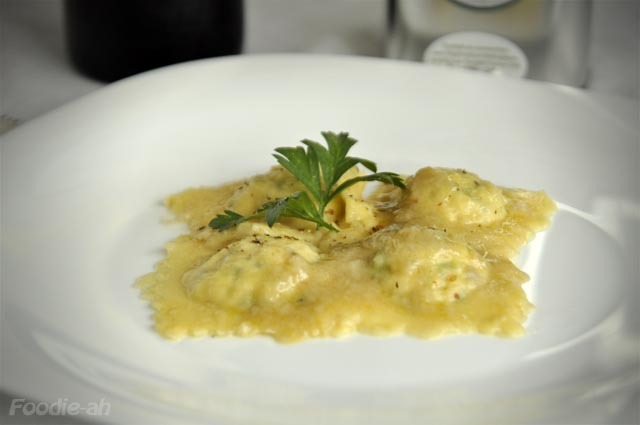 Given that the filling should be the focus of the dish, I prefer my ravioli with lighter, simpler sauces than what I would use on plain pasta. Unfortunately making ravioli is more involving and messy than boiling some dried pasta, but then again it's fun and ful-filling (pun intended! ), and you can freeze them for another treat! 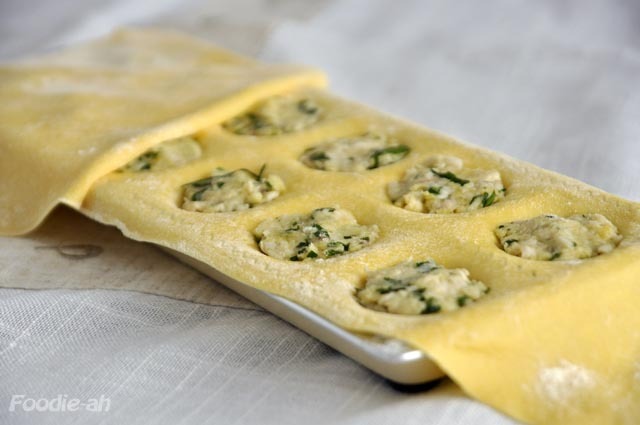 Mostly, ravioli are filled with ricotta cheese and spinach or various meats. I opted for a lighter, more subtle sea-bass ravioli, to be enjoyed with a flavoursome clam and fish sauce. Mix all the ingredients well and knead until smooth (I used an electric mixer), then roll into a ball, wrap in cling film and let rest in the fridge for at least an hour. Some herbs. I used parsley, fresh oregano and chives. Steam the sea bass until cooked, remove the skin and separate out the meat. 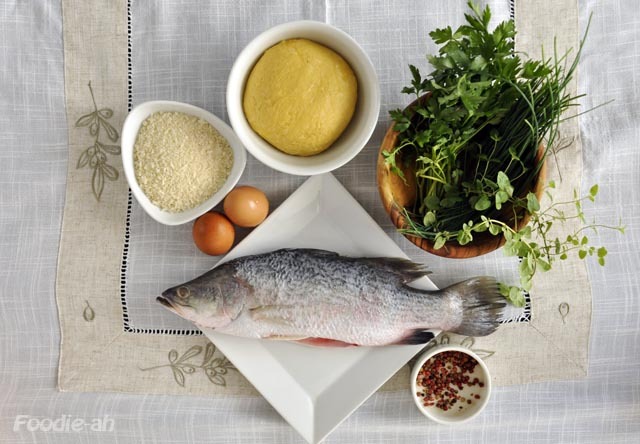 Finely chop the herbs, then mix with the sea bass meat, the egg, the breadcrumbs (or softened bread), and a pinch of salt. Mash gently using a fork, until you obtain a mixture that can be scooped into your ravioli. Pull out the dough from the fridge and roll into thin sheets using a pasta machine. These need to be thinner than you would roll if you were making tagliatelle, as you don't want your ravioli to feel "doughy". I used a raviolatrice (see picture) to fill my ravioli, but you can easily make them one by one by hand, it just takes a little longer. I made the accompanying sauce with a 50-50 clam and fish stock reduction as I had these two ready made in my freezer. Make the sauce by mixing in equal parts clam and fish stock in a frying pan together with a few tablespoons of tomato water and reducing on medium heat with a lemon zest and a sprinkle of breadcrumbs. Reduce until the sauce reaches the right level of thickness, then remove from the heat. Tomato water: to make tomato water, blend a couple of fresh tomatoes, wrap the blended pulp into a cheese cloth and place onto a colander on top of a bowl. The tomato water will slowly drip over an hour or two. 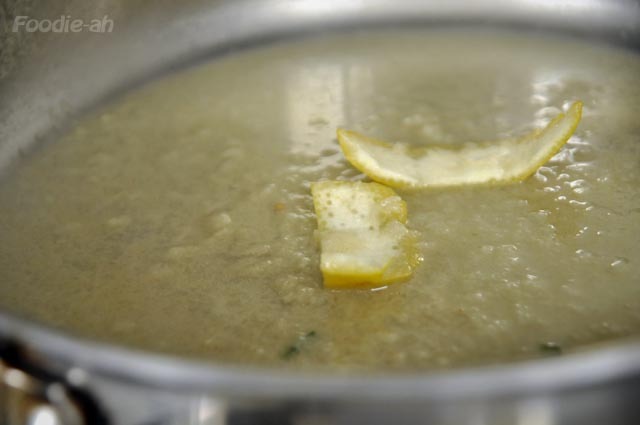 Clam stock: simply sauteé the clams until they open up and release their juice, then separate the clam juice out. Fish stock: Simmer the bones and of the fish over slow heat together with an onion, a stalk of celery, some button mushrooms, and preferably some fennel and fresh parsley. The stock will be ready after about 40 minutes. 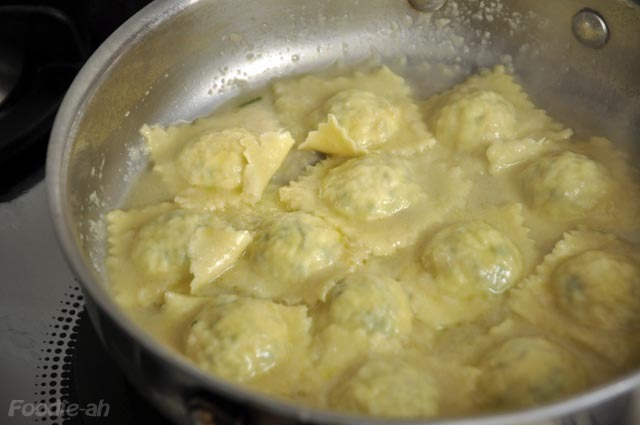 Finally, boil the ravioli for a couple of minutes in a large pot of water, drain them out of their water and place on high heat into the frying pan together with the sauce. Sauteé for a couple of minutes, basting them with their own sauce, then remove from the fire and top with some delicate extra virgin olive oil. The ravioli are ready to be served. I just found your blog while searching for corzetti molds! Thank you for sharing your wonderful recipes!